Like the screen attachment, the Add A Room attaches by means of a hook and loop attachment system combined with snaps. The screen panels are covered with integrated zip up windows for privacy and weather protection.The Double Zippered door is on the short side towards the trailer hitch. 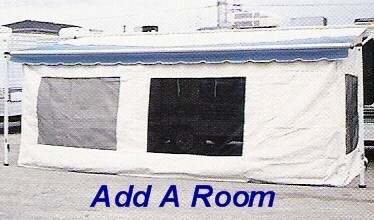 To order, please be sure to provide the length of the front bar of your awning. Designed for a 104 inch awning rail to ground height, standard. If you have a taller height please email me. There will be a small additional charge to make the modifications for a proper fit. I prefer shipping USPS Priority Mail to Canada. I costs a little more but, it is quicker and you will not be charged a Customs Fee. UPS generally charges a $30-$60 customs fee. USPS does not.